This security patrol robot was created by students at the University of Oklahoma. It can autonomously patrol even challenging locations; it uses as its base an all-terrain vehicle (ATV). It navigates using an obstacle avoidance system that makes use of sonar sensors on the front and sides of the robot's chassis. It can communicate video and audio wirelessly as it follows a pre-programmed patrol route. First, a path plan is provided to the ATV planner to best decompose the task into subtasks and then the ATV go ahead and deliberates (plans) what are the suitable behaviors to accomplish each one of them. In other words, a set of checkpoints is provided to the control system as a route for the ATV to go thru. A file containing an array of GPS coordinates and special tasks (waiting time, camera auto pan, hunk horn...etc) is delivered to the planner. The planner reads the file and divides the route into sub-routes, where each one is from the current location to the first unreached location in the array. After that, the behaviors start executing based on a reactive control, sense-act. At each control instance, the control system senses the world then sends commands to the ATV to act based on the inquired values. The system keeps behaving in that same manner until the submission is accomplished or an emergency status requires change of behavior. Security guard robots have also been depicted in science fiction films. 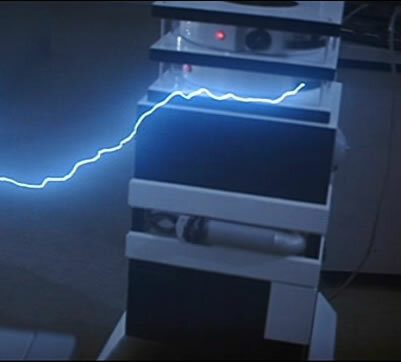 Take a look at the autonomous guard robot from Michael Crichton's 1985 film Runaway. 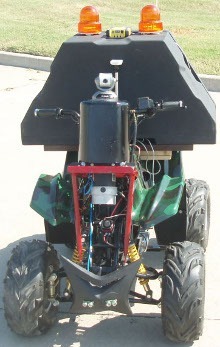 From Development of an Autonomous ATV for Real-Life Surveillance Operations (pdf) via hack a day.